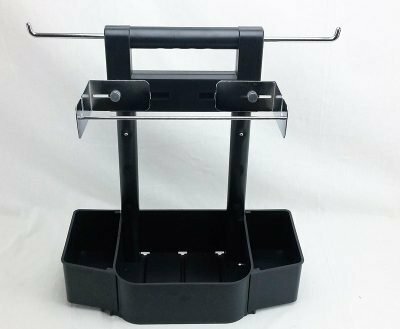 The grill tool caddy organizes and holds everything you need to carry out to your grill except the food. 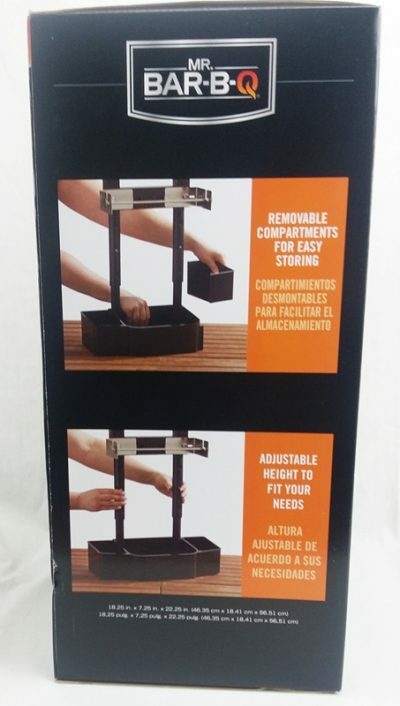 It is adjustable to fit anyone’s needs. 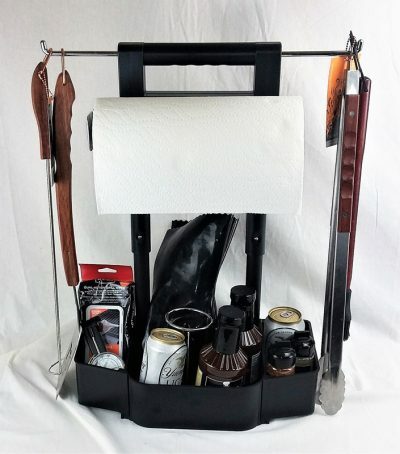 The grill tool caddy has hooks for holding your tools and three trays for carrying just about everything else. 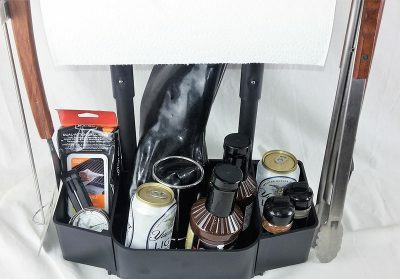 It even bar for holding a roll of paper towels. 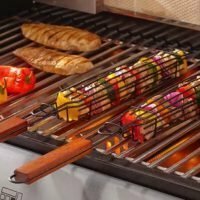 I am not going to say this is the greatest grilling accessory ever made but, it has to be close. I will get in depth with this item description working from the top down. The handle on the top of the grill tool caddy extends up and down with three different settings, depending on your needs. 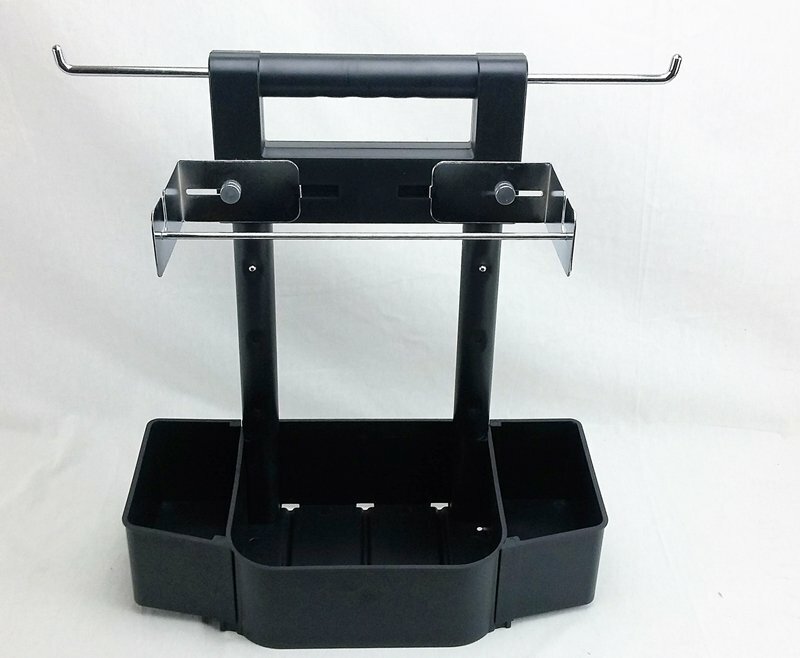 When fully extended it is 22 inches tall, this is tall enough to hold my extra long tongs from the hooks. The handle adjusts with those simple buttons you push in, while you pull to extend it. 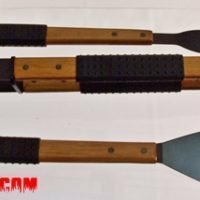 Those tool hooks extend in and out. 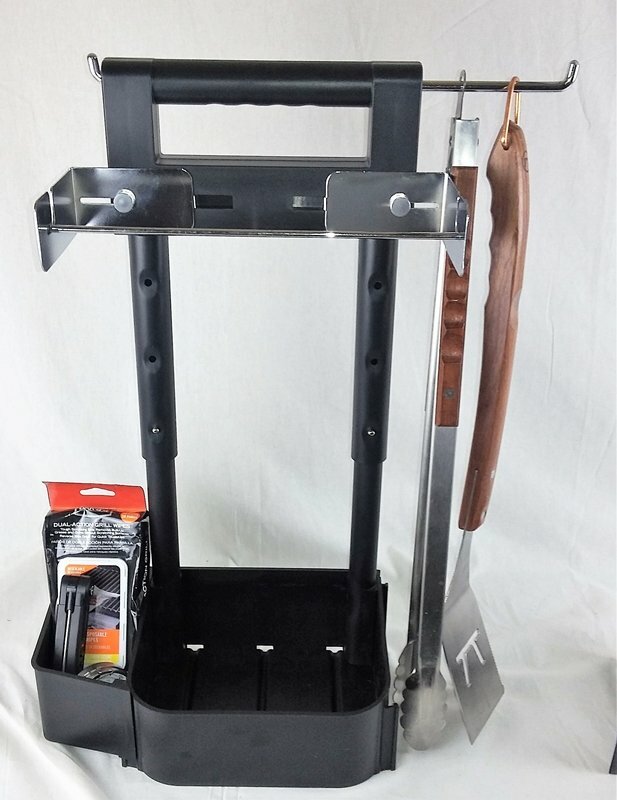 If you don’t want your tools handing above your trays. Just pull the hooks out all the way. Don’t want to hang your tools at all just push them in, out of the way. 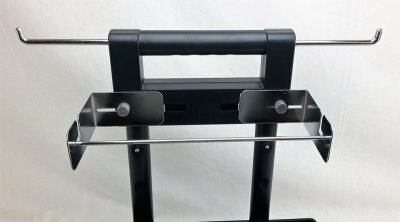 Down the handle of the grill tool caddy are metal bars that are designed to hold a roll of paper towels. These also extend in and out. So this lets you get some friction on the side of the roll to keep it from spinning freely in the wind. 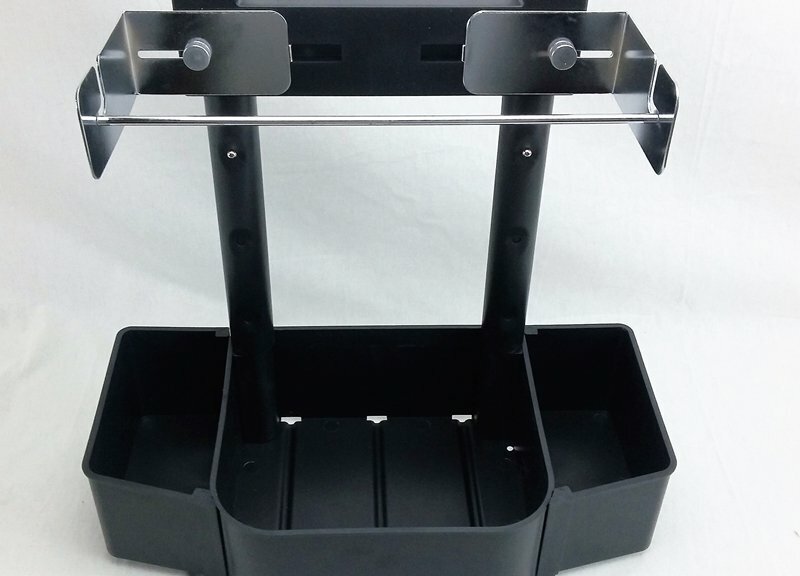 On the base of the grill tool caddy there is one permanently mounted center tray. This is large enough to hold a 6 pack of beer or other stuff if you prefer. 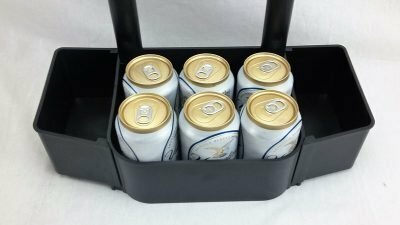 The grill caddy also comes with two smaller ( 2 beers each) removable trays that can be used or not used. These trays hold a lot of stuff. This is the best part of this job, because when something like this comes along I get to snag one and use it. The way I have my grill tool caddy setup is: The top handle fully extended with the left side hook pulled all the way out. So I hang all my tools on this side and push the other hook in all the way. I have the additional tray on the right side but not the left. We have a smaller side table and this allows my tools to hang freely off one side and still allows plenty of room for other things. Because my tongs are 22 inches long that is the maximum height for this. 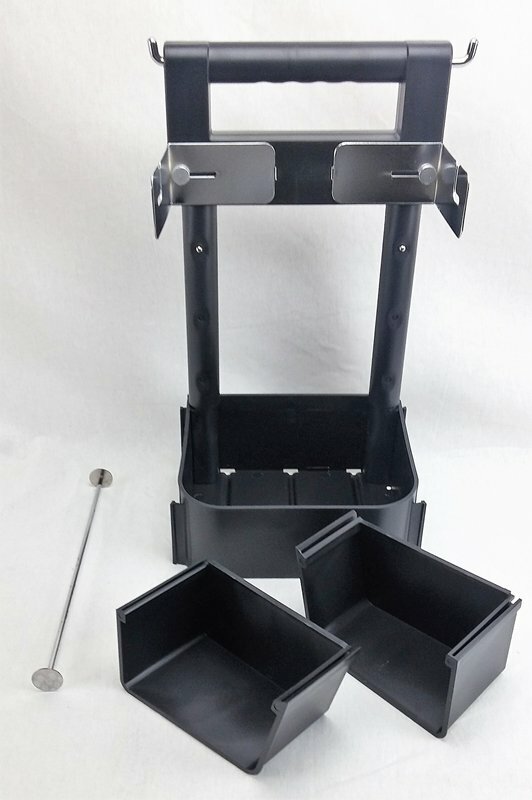 Empty the grill tool caddy is top heavy and wants to fall backwards. When the handle is fully extended, so always have something on the bottom. Since it is made from a hard plastic it will easily wipe clean with soap and water. 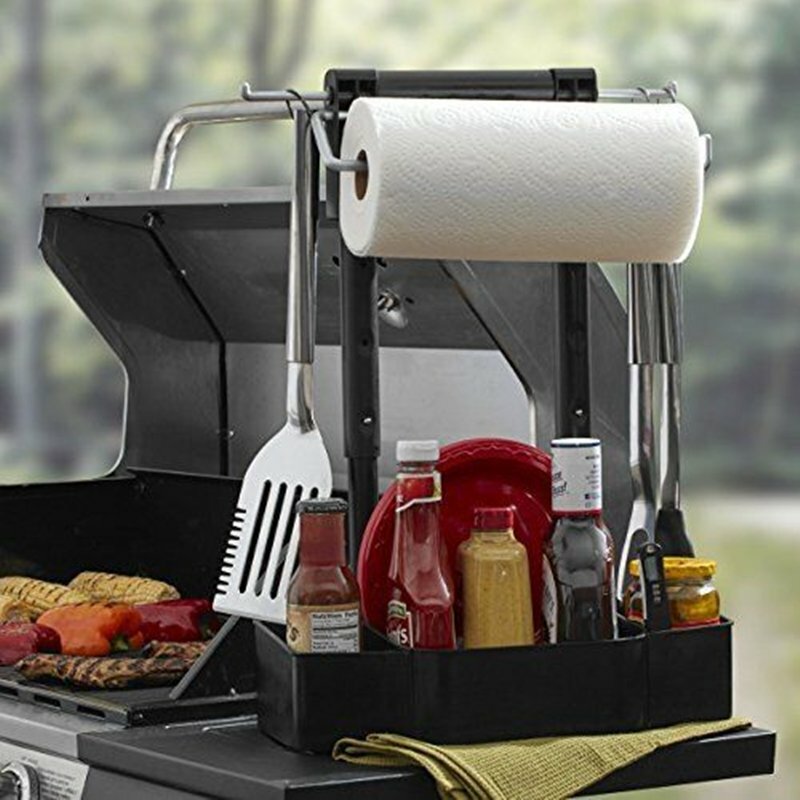 When not in use just slide a clean trash bag over the top of your grill tool caddy. 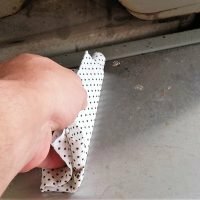 This will keep everything clean until your next use. 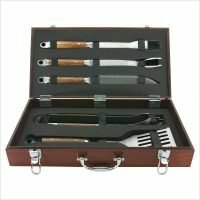 This is a great grilling gift idea or can be used as the base of an awesome grilling gift basket. Note: This is just the caddy, other items in the images are not included. 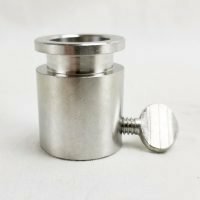 This is one of our favorite items we use it all the time. 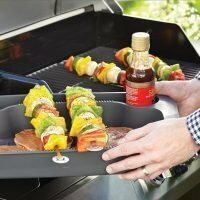 It carries everything we need to grill and then some. 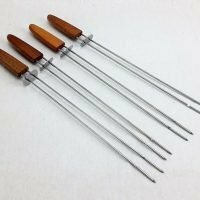 For our reviews we are always swapping out tools for almost every cook and this handles them all. 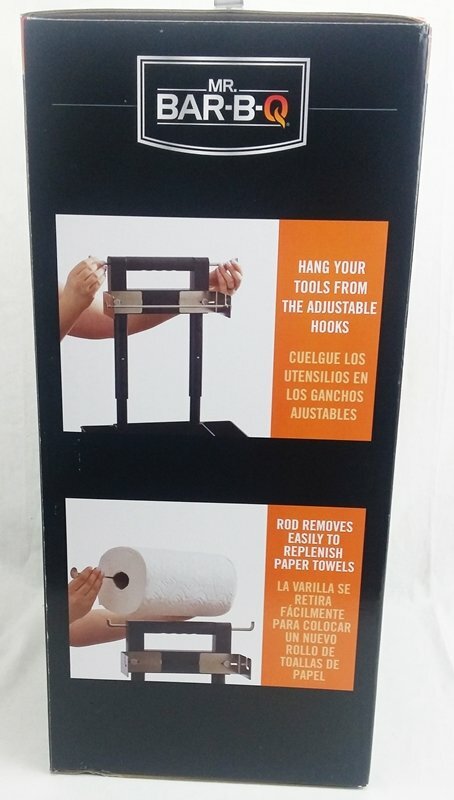 I have been using it for over a year now and cannot believe we lived without it for so long. We will only review products that we actually use.